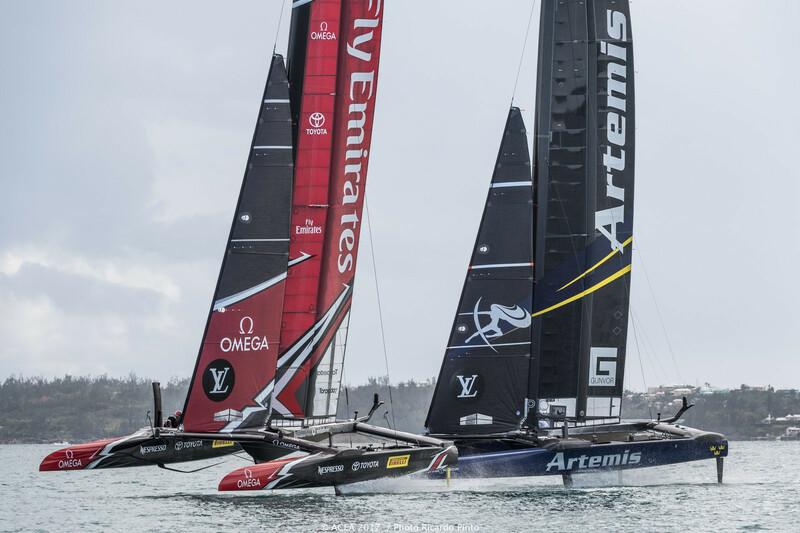 The drama of the Louis Vuitton America’s Cup Challenger Finals carried through a delay-plagued day to see Peter Burling’s Emirates Team New Zealand (NZL) win the first scheduled race to close out the series 5-2 against Nathan Outteridge’s Artemis Racing (SWE). The deciding race was a do-over after the first attempt at race seven was abandoned when the 25 minute limit expired. That race got underway in 7 knots, where it was all New Zealand as they won the start after the Swedes were OCS, extending quickly until the wind dramatically dropped on the ensuing upwind leg. The Swedes closed at the upwind gate but copped another penalty, with both teams drifting downwind as the Great Sound glassed off and time ran out. After an hour’s delay, the stormy skies cleared with winds returning to 7 knots for the start to get underway just minutes before the deadline. Another good start by the Kiwis saw them leverage their leeward position to an insurmountable 56 second lead at the finish. The Kiwis certainly had no peer in the low winds, easily staying on their foils through maneuvers and showing a speed edge up and downwind. The final stage of the 35th America’s Cup will commence on June 17 with Jimmy Spithill’s Oracle Team USA lining up against the Emirates Team New Zealand, a rematch of the Final in 2013 which saw the Kiwis build an 8-1 lead, only to see the Defender win 9 straight races to take the trophy. Oracle Team USA will take on the best Challenger, with the winner of the 35th America’s Cup to be the first team to claim seven points. The caveat is if one of these two teams had previously won the Qualifiers (first stage), the opposing team will begin this Match with a one point disadvantage (i.e. minus 1), meaning they will need to win eight races while the advantaged team must win seven races. As Oracle Team USA did in fact win the Qualifiers, the Defender effectively begins the series with a one point advantage. The rules of the 35th America’s Cup state the winds need to fit between 6 and 24 knots, and the habits of the Atlantic Ocean kept the four Challenger teams ashore today as conditions exceeded the upper limit. The second stage of competition in the 35th America’s Cup got underway today with clear skies and ideal winds in the mid-teens as the top four Challengers met on day one of the Louis Vuitton America’s Cup Challenger Playoffs. Land Rover BAR retired from first race due to damage and had to concede the second race. The Louis Vuitton America’s Cup Challenger Playoffs : From June 4 to 12 – the Defender now gets out of the way, with the top four Challengers split into two Semi-Finals (best of 9) with the winner of each match to meet in the Final (best of 9) to determine who will take on Defender in the America’s Cup Match. ORACLE TEAM USA beating Emirates Team New Zealand and clinching the crucial top spot in the final leaderboard. That gives the US team a point in the America’s Cup Match, presented by Louis Vuitton, the final round of the events taking place in Bermuda. Mother Nature has proved that she is the only force that can beat the collective might of the America’s Cup teams. She delayed day one of racing with excessive winds, and she returned today with winds that proved to be too light. An announcement today by the America’s Cup Event Authority (ACEA) and America’s Cup Race Management (ACRM) confirmed that the four scheduled Round Robin 2 Louis Vuitton America’s Cup Qualifiers races planned today would have to wait until tomorrow. When velocity is outside the 6 to 24 knot wind range, racing is postponed, which has thus far occurred on two of the six scheduled race days. The second round robin of the Louis Vuitton America’s Cup Qualifiers began today, which will see each of the six teams competing against each other one last time to determine the top four challengers that will advance to the next stage. Three of the 15 matches were held today. The Louis Vuitton America’s Cup Qualifiers got underway today with six matches that begin the double round-robin stage to determine the top four challengers to advance to the next stage. The Louis Vuitton America’s Cup Qualifiers: From May 27 to June 3, all six America’s Cup teams – will compete in a double round robin match race series where each competitor races every other team twice – a total of ten races each. Wins earn one point, and the four Challengers with the most points advance to the next round. As the top two teams from the 2015-16 America’s Cup World Series, Land Rover BAR and Oracle Team USA gained an advantage of 2 points and 1 point respectively going into the AC Qualifiers. The America’s Cup Event Authority (ACEA) and America’s Cup Race Management (ACRM) announced that the strong winds in Bermuda has meant that day one of the Louis Vuitton America’s Cup Qualifiers and the Official Opening Ceremony of the 35th America’s Cup has had to be postponed. Forecasts indicate that winds may gust over 30 knots during the afternoon and evening, so with the safety of the sailors and spectators as the key priority, ACEA and ACRM have decided to postpone Friday’s events. Saturday, 27th and the days following are all forecast to have significantly improved weather conditions, so the four races scheduled to take place on Friday, 26th will now be added to the race schedules for the subsequent days.